Digest What’s The Deal With Dry-Aged Fish? What’s The Deal With Dry-Aged Fish? False. It’s a total myth that good sashimi comes directly from sea to sushi counter. 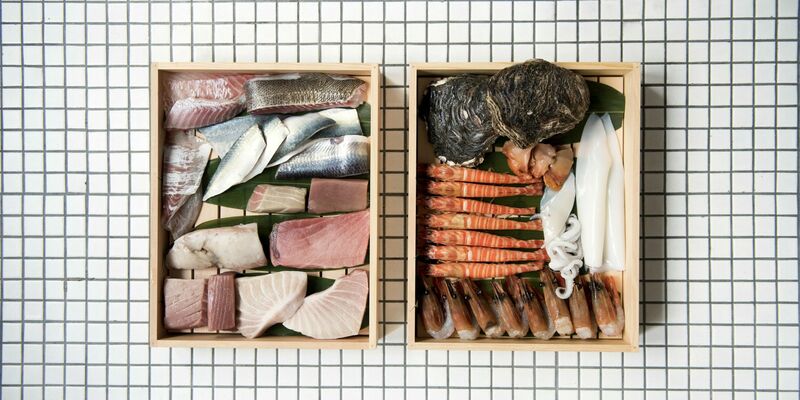 The reality is that raw fish, especially in the finest Japanese restaurants, are aged. Just as steak lovers know about dry-aged beef, the sushi cognoscenti are well aware of the fact that the finest slabs of raw fish have been sitting in the itamae’s kitchen for days. Many varieties of fish (the perpetually popular tuna included) have hardly any taste when served too soon after the catch. No umami is present, while texture is usually tough. It’s a total myth that good sashimi comes directly from sea to sushi counter. The reality is that raw fish, especially in the finest Japanese restaurants, are aged. Dry-ageing enhances both taste and consistency by reducing moisture and breaking down the enzymes within the animal protein. Flavour molecules such as glutamate and insulate are released, adding complexity and umami levels. The breakdown of proteins also tenderises the fish, making raw seafood easier to digest. Korea and Southern Japan do prefer the chewy bounce of uncooked “fresh off the boat” fish, which naturally requires more muscular condiments like fiery gochujang or a tart ponzu with scallions. However, you will rarely find “fresh” raw fish like that at any of the venerable shrines of Edomae (traditional Tokyo style) sushi, or even at the newer institutions of Japanese fine dining. Kombujime is the classic ageing technique of Edomae sushi. Fish are lightly salted, rinsed in water or sake, patted dry and pressed between sheets of kombu (kelp), then weighed down from anywhere between two hours to two days. Big fish like tuna can be aged for up to 15 days or more. At a recent dry-ageing workshop organised by Slow Food Hong Kong, around 20 members of the group gathered by the counter of Okra Kitchen, chef Max Levy’s creative izakaya in Sai Ying Pun, tasting five pieces of aged ishigakidai (wolf-beaked perch). “Not an expensive white fish, but not a cheap one either,” Levy expounds. “Day 1” was rather watery. “Day 3” had a more buttery taste — not full cream, but with a perceptible oiliness. “Day 5” had the maximum amount of umami with an agreeably waxier bite as the glutamates glistened on the surface. Levy dry ages his fish in two ways. Fattier cuts for sashimi are washed in brine and stored loosely wrapped in draughty conditions at four to five degrees. As long as the temperature doesn’t go up above ten degrees and the humidity above 60 percent, the fat will not go rancid and cook itself. “Pay attention to the smell of ammonia or sourness. Any hint of it means that the fish is off,” clarifies the chef. Leaner cuts for roasting are stored unwrapped in a fish freezer immediately after cutting and flash frozen by either a blast chiller or liquid nitrogen. This allows a slow evaporation of moisture and helps concentrate flavours. Up on the 101st floor kitchen of Tenku Ryugin, Chef de Cuisine Hidemichi Seki places a fat, flipping makogarei (marbled turbot) from Chiba on his chopping board, preparing for the month’s multi-course modern kaiseki menu. He makes a cut just behind the head, above the gills, severing the major artery and spinal cord. A second cut by the tail hastens the bloodletting. He then inserts a wire with precise expediency behind the eye, into the hindbrain. This Japanese technique of fish execution known as ikejime, when done correctly, causes immediate brain death, ceasing all muscle motion. Ikejime basically prevents rigor mortis and the subsequent production of lactic acid, which makes sashimi sour. Seki believes that this method of butchering fish is crucial before ageing sashimi. “Damaged flesh will not age properly,” stresses the chef. He fillets the fish in a zig-zag manner according to the direction of the muscle fibre, keeping destruction of the flesh to a minimum. Seki then lightly salts the fillet for ten minutes to remove moisture, then washes it with water. He blots the fish with drying paper and peels the paper away in accordance to the grain of the muscle as well. Bright red kinmedai (splendid alfonsino) is chosen to be grilled. Before it can be cooked, Seki salts the fish lightly but does not wash it to keep its fat content. The fish is then put on ice and aged for three to five days before taken out to air dry. The dry-aged kinmedai is rotated slowly over an open flame, placed on a rack high above the heat to rest for a few seconds, and then returned to touch the fire, over and over again. The air-dried skin blisters but the flesh is never overcooked. Dusted lightly with only a powder of salted plum, it’s the most ambrosial grilled fish I've ever tasted. While freshness is a gift from nature, ageing fish produces works of art —whether served raw or cooked.